Sequins, Secrets, and Silver Linings by Sophia Bennett. Grades 6-9. Chicken House/Scholastic, January 2011. Originally published as Threads in the UK in 2009. 281 pages. Reviewed from ARC provided by publisher. When 14-year-old Londoner Nonie and her best friends discover a genius fashion designer, it's up to them to help her out. Crow's a 12-year-old Ugandan refugee and her family's still in Uganda, danger threatening at all times. Her father sent her to England to study and thinks she should be concentrating on "serious things", but Nonie and her besties think they can figure out a way for fashion to come to the rescue! Calling all fans of Project Runway and Top Model: this book's for you!! This is a very sweet story with a lot of heart and it’s perfect for tweens who like chick lit with a little meat on its bones. True, a lot of the book is about fashion, designers, outfits, runways, and red carpets. But it’s very nicely juxtaposed with Nonie and her friends’ concern about what’s going on in Uganda and how they can help. Sophia Bennett gets her ratio of fluffy, girly stuff to serious stuff just exactly right, which is one of the reasons I loved this book. Nonie’s growth as a character was another thing I loved. Nonie narrates our story and she’s got two best friends – Edie is studious and hopes to attend Harvard, and Jenny is a teen actress who just wrapped up her first major film. They’ve each got big things going on in their lives and sometimes Nonie feels a little bit… adrift. Sure, she has a passion for fashion, but she’s not really sure where that’s going to take her (except maybe serving tea to Vivienne Westwood). In Nonie, readers have a character to root for as she takes stock of her situation and tries to help. Nonie’s not perfect, but she believably grows throughout the novel and that was a very nice thing to see. I also loved what Ms. Bennett did with Crow. At first I thought it was going to be impossible to feel like I knew Crow at all. She’s mostly silent. She’s been through things that she’d rather not talk about. But by the end of the book, I felt like I knew Crow just as well as the rest of the girls, and that’s not an easy feat when a character has very little dialogue. Now, I’m not sure I completely buy that these characters were 12 and 14 years old (they seemed older), but I am sure that I loved the book enough to suspend my disbelief. I’d hand this in a heartbeat to all the fashionistas in your teen section and I’d also try it on kids who like chick lit with a more serious side (think Sisterhood of the Traveling Pants). Check out another review at Forever Young Adult. 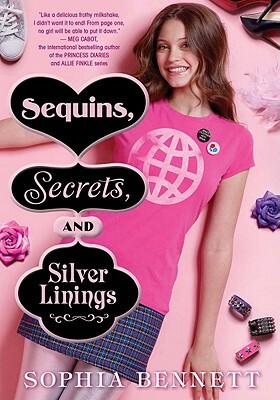 Sequins, Secrets, and Silver Linings is on shelves now!